The March birthstone is Aquamarine.The word 'aquamarine' is derived from the Latin words 'aqua' which means water and 'marina' which means sea. It was named so because it reflected the color of the sea water - sea blue, pale blue, sky blue, sea green, etc. The aquamarine was used to treat fear, reverse poisoning, and other diseases of the body. Sailors used to wear aquamarine stones to protect themselves in their difficult ocean voyages. Aquamarine is believed to keep the wearer healthy and free of diseases. It is also believed that the aquamarine can re-ignite love and passion in someone's troubled married life . Aquamarine is also supposed to give foresight to the person wearing it. 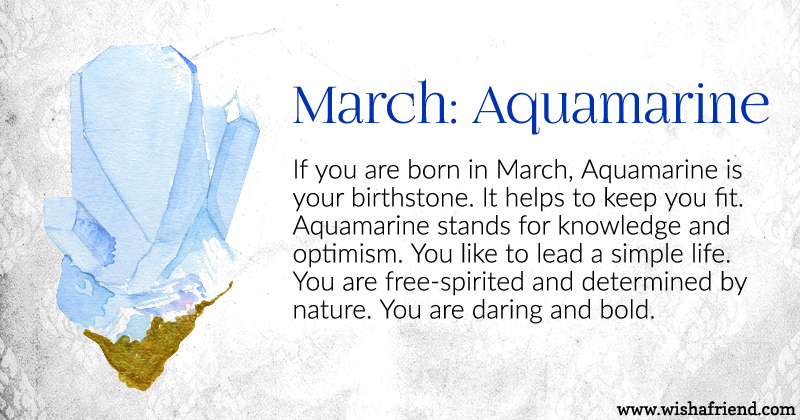 Aquamarine birthstone signifies wisdom, safety and courage. If you wear your birthstone Aquamarine, it is supposed to bring these positive changes in you. You will love peace and serenity. But when required, you will be extremely courageous and have a fighter spirit. Aquamarines which are blue-green or sea-green in color are heated to high temperatures where their color changes to real blue. This change is permanent.